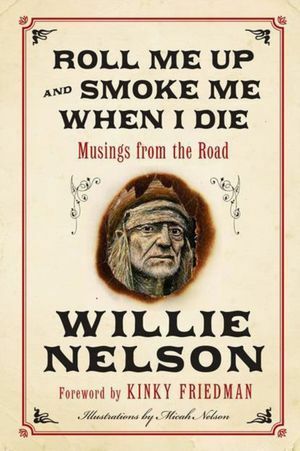 In Roll Me Up and Smoke Me When I Die, Willie Nelson muses about his greatest influences and the things that are most important to him, and celebrates the family, friends, and colleagues who have blessed his remarkable journey. Willie riffs on everything: music, wives, Texas, politics, horses, religion, marijuana, children, the environment, poker, hogs, Nashville, karma, and more. He shares the outlaw wisdom he has acquired over eight decades, along with favorite jokes and insights from friends and others close to him. I borrowed this one from my dad, who got it (signed copy!) as a Christmas gift last year. After seeing Willie Nelson perform live in Kansas City just a few months earlier, I knew I had to ask my dad if I could borrow it and finally got around to reading over my Thanksgiving break. Roll Me Up is more a stream-of-consciousness journal than straight-up memoir, so if you’re interested in learning more about Nelson’s life, this isn’t the book. But it’s really a charming little gem, and even at 192 pages, it’s actually a short, quick read. While it isn’t a work of deep reflection, necessarily, Roll Me Up is a heartwarming family project—the illustrations by Nelson’s son and family photos interspersed with testimonials from long-time band members and Nelson’s wife, children, and grandchildren are very sweet. If you’re a fan of Willie Nelson you’ll enjoy reading his thoughts on myriad subjects (mentioned in the blurb above) in Roll Me Up. Nelson has a great sense of humility and humor, and it’s clear he doesn’t take the love and assistance he’s had along the way for granted. I think if this is available on audio (narrated by Nelson), with clips of his music included, that would be an awesome way to experience Roll Me Up. It would be great on a road trip, of course! Read from November 29 to 30, 2013. This entry was posted in books and tagged family, friendship, humor, memoir, music, non-fiction by kristin @ my little heart melodies. Bookmark the permalink.